I’ve always been a big fan of Anthony Bourdain, I just love the guy! So, of course, before I got to New Orleans, I did some research on some of his local favorites and found Atchafalaya.The name, long river in choctaw, sounded interesting and his comments were quite favorable. So, I left the French Quarter behind and took a ten minute cab drive to the charming Garden district neighborhood. In 2005, right after hurricane Katrina, owners Tony Tocco and Rachel Jaffe Tocco turned this historic locale into a chic neighborhood eatery refurbishing it inside with reclaimed materials left from the storm. It seemed like the perfect place to go for an authentic New Orleans meal, away from tourists and crowds. On the corner of beautiful tree-lined Louisiana avenue and Laurel street, stands this lovely wooden structure that, from the outside, looked more like a small cafe. 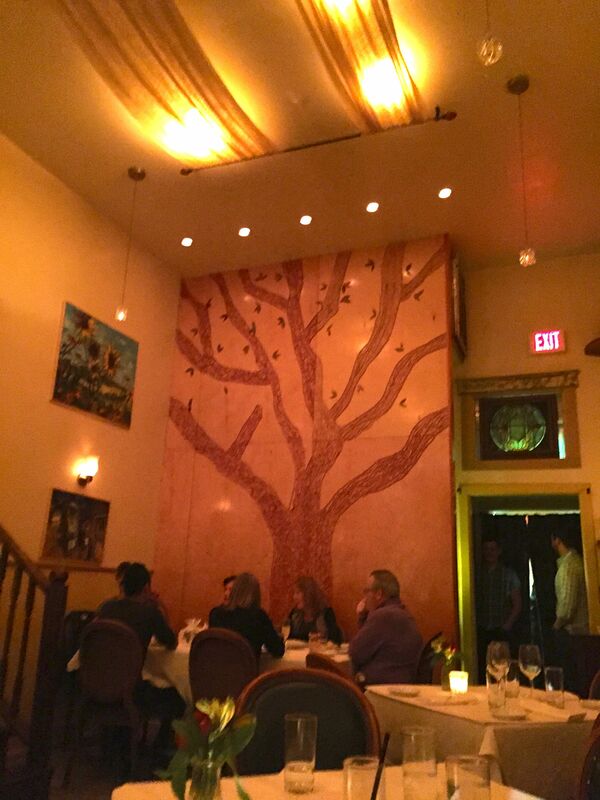 Little did we know that inside, a charming and intimate space of dim lights and comfortable seating would welcome us into what would be one of the best dining experiences we ever had. 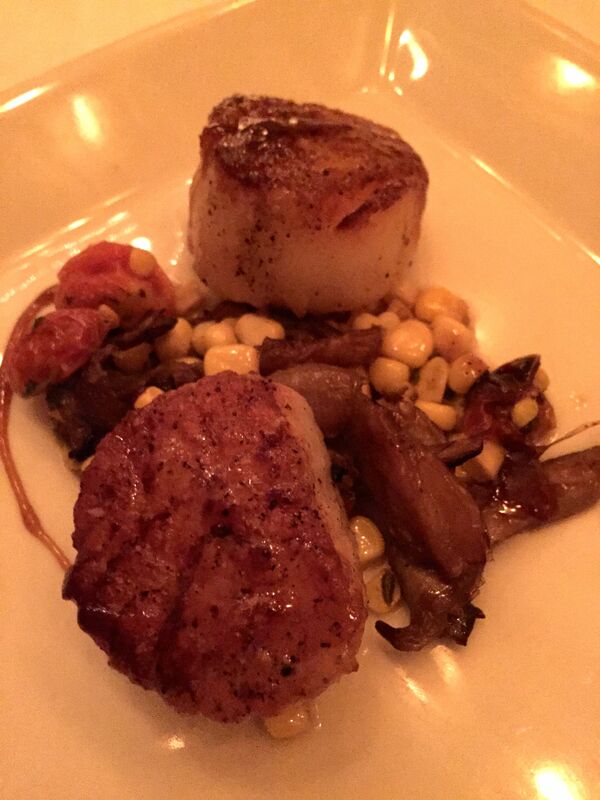 We were happy to see a menu full of great seafood choices like the amazing Maine diver seared scallops served with sweet corn, mushrooms and roasted cherry tomatoes with a drizzle of sherry caramel for $16. 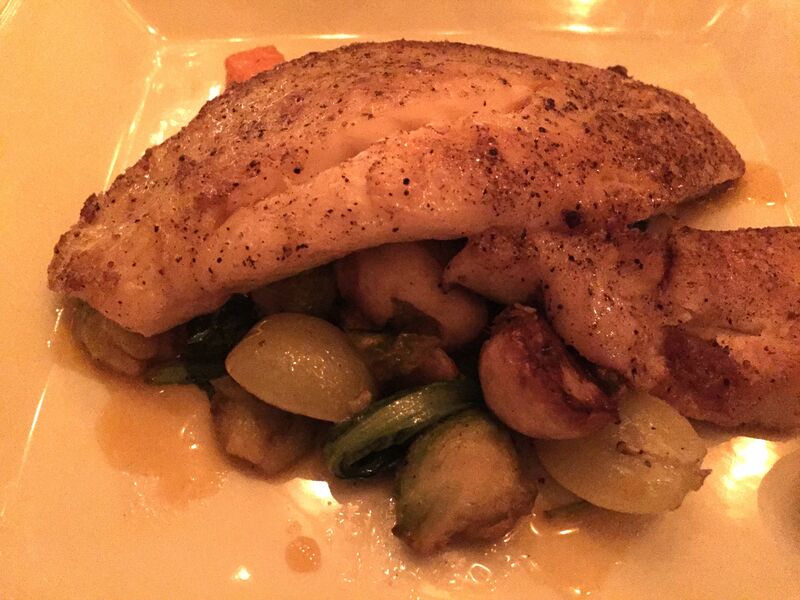 For the main course, I ordered some of the local fish know as Drum: two fillets of a tender and flaky white fish sautéed with smoked turnips, Brussels sprouts, sweet potatoes, totsoi (Asian spinach), grapes and an orange basil gastrique (caramelized vinegar sauce) for $30. 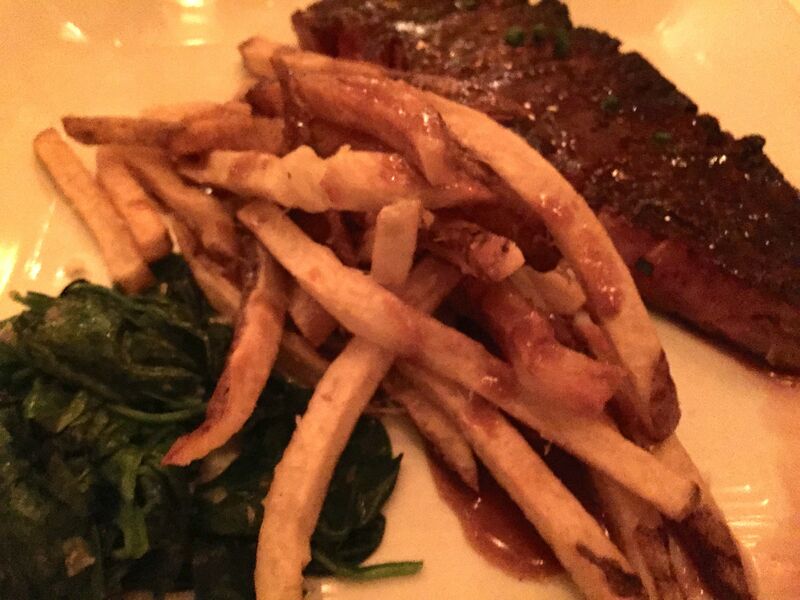 The pecan smoked New York strip steak was quite interesting: perfectly grilled Louisiana grass fed beef, french fry “poutine” ( gravy) and a delectable foie gras-red wine sauce served with sautéed baby spinach for $36. 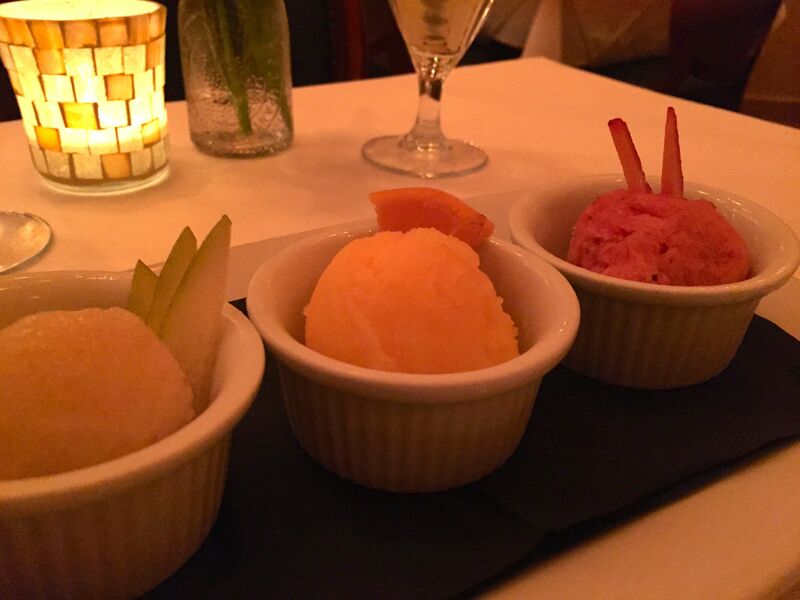 Dessert was a nice surprise: a trio of homemade sorbets of strawberry, peach and the delicious satsuma, a mild citric fruit native to the area that offered the perfect balance of sweet and sour for $8. Don’t ever be intimidated by a long name like Atchafalaya, you’ll be pleasantly surprised with what hides behind it! Definitely the best food I had in New Orleans. 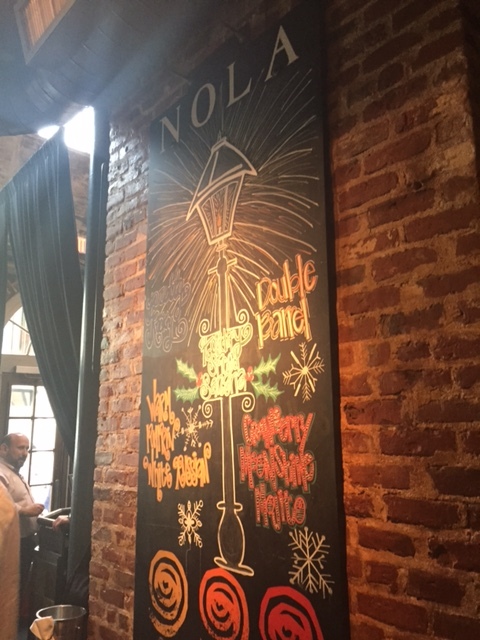 I couldn’t leave New Orleans without trying one of celebrity chef Emeril Lagasse’s popular restaurants so I gave Nola a try for lunch. Located in the heart of the French district, this rustic eatery which is named as the acronym for the big easy, offered an interesting menu of mostly creole cuisine. Brick walls, high ceilings and an ample open kitchen give it a lofty appeal straying from some of the rococo joints in the area. 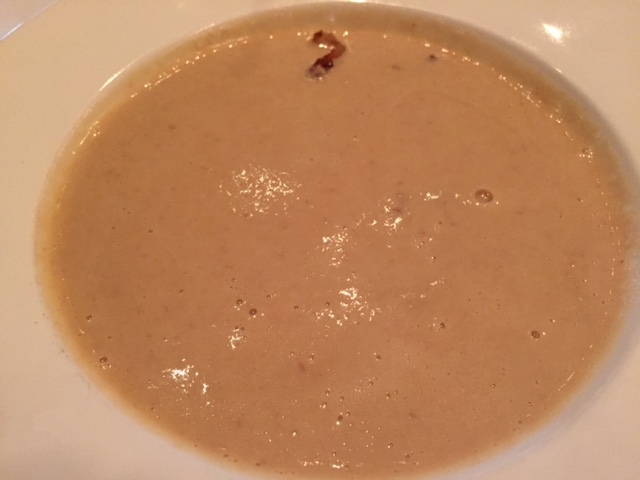 To start, I ordered the bacon cauliflower soup for $8 that although lovely in texture and flavor, could’ve used less salt. Along came some delicious homemade brioche and some jalapeño corn bread from Nola’s in-house bakery, giving the place a fine Portuguese touch of Lagasse’s roots! After walking around for days and seeing po’boys advertised in every corner, I made it a mission to try Lagasse’s. A French bread sandwich made with whatever is in offer. 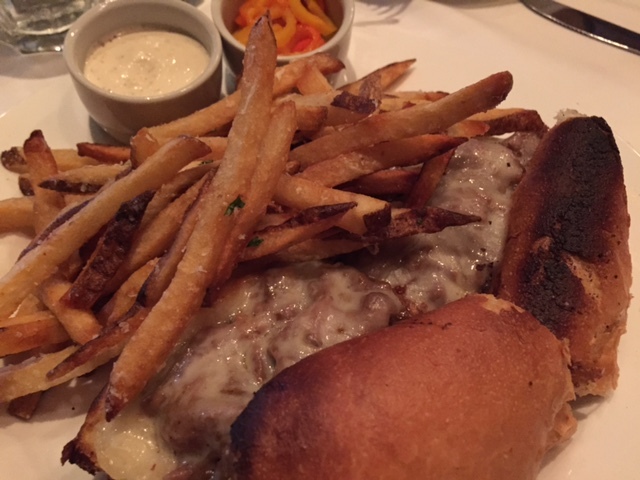 Here it was the braised pork cheek po’boy with Provolone cheese and a side of house cut fries for $15. All served along some creole mustard aioli and giardiniera ( pickled peppers). Although very tasty, I must say that the cheese was unnecessary. The cheeks are flavorful and fatty enough, no need to add anything! 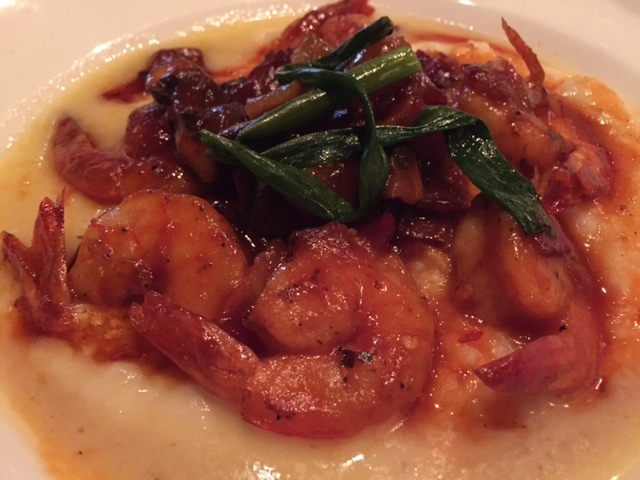 One of my creole favorites has always been the shrimp and grits so I had to give Emeril’s a try; sautéed gulf shrimp, grilled green onions, smoked cheddar grits, applewood smoked bacon, cremini mushrooms in a red chili abita butter sauce for $19. Perfectly cooked shrimp over tender and smooth ground corn in an absolutely delicious sauce that gave it a nice little kick, heavenly! All in all, it was a really enjoyable experience to try a menu created by Emeril Lagasse, a Portuguese -French-Canadian who’s become the quintessential New Orleanian! What do you get when you mix a little bit of New York with a little bit of Texas? You get Cindi’s New York Style Delicatessen! A sensational diner owned by renowned Vietnamese restauranteur Anh Vo who’s been serving hungry Dallasites for well over twenty years. We were off to a good start when the lovely hostess asked us to wait for twenty minutes but really meant ten. As we were seated in a comfy booth, a friendly waitress handed us a huge menu that required a couple of minutes to go through. There’s no denying the Mexican influence in the local cuisine wherever you go in Texas and Dallas is no different. 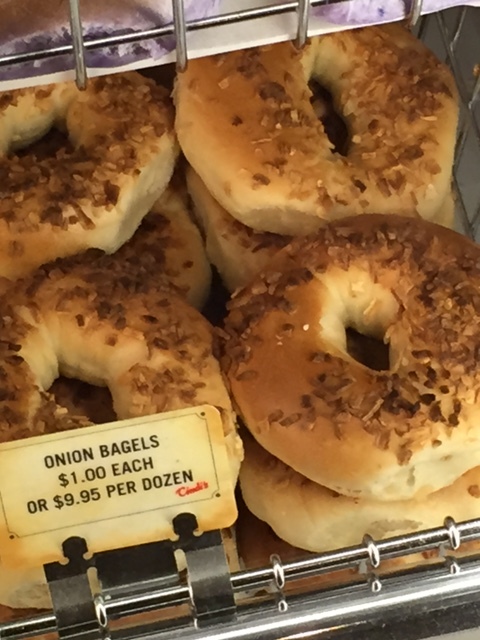 Even though there is some Yankee influence here with the grand assortment of bagels , huge pastrami sandwiches and the fine lox, the breakfast menu offers a nice selection of Tex-Mex. I chose the scrambled eggs with chorizo for $ 9.99. 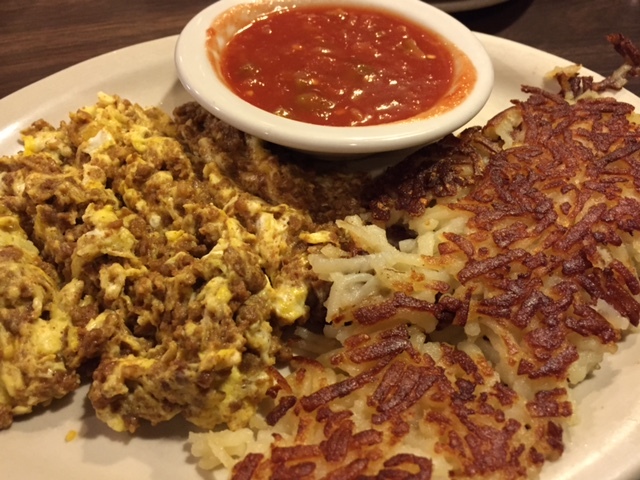 Three large eggs scrambled with the insides of what Mexicans call chorizo, a similar blend to its Spanish counterpart but with a little more kick. As a side came a scrumptious, crunchy on the outside and moist in the inside, order of hashbrowns that I couldn’t finish, three warm corn tortillas, and some mild salsa. I also ordered a side of sour cream to tame the devilish spice in the sausage. It was just a little too early for so much heat! 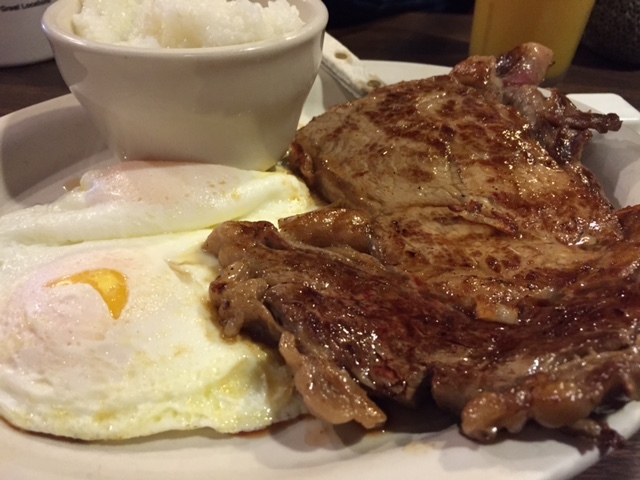 My sidekick had the perfectly grilled ribeye steak and fried eggs, a true protein packed Texan breakfast that seemed to satisfy. 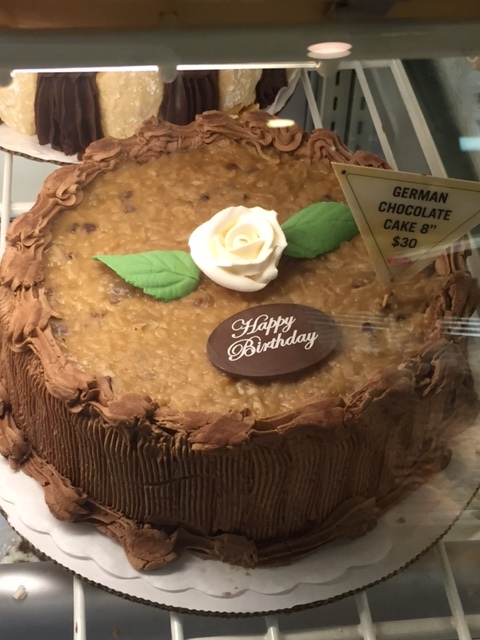 I just wished I had come here with more appetite so I could try many other tempting items on the menu like one of their great sandwiches or lovely looking German chocolate cake. Oh and that lemon meringue pie! Next time I return to Dallas, I will starve myself for three or four days before I come back to Cindi’s to devour everything in sight.